Teachers are at the heart of everything we do. 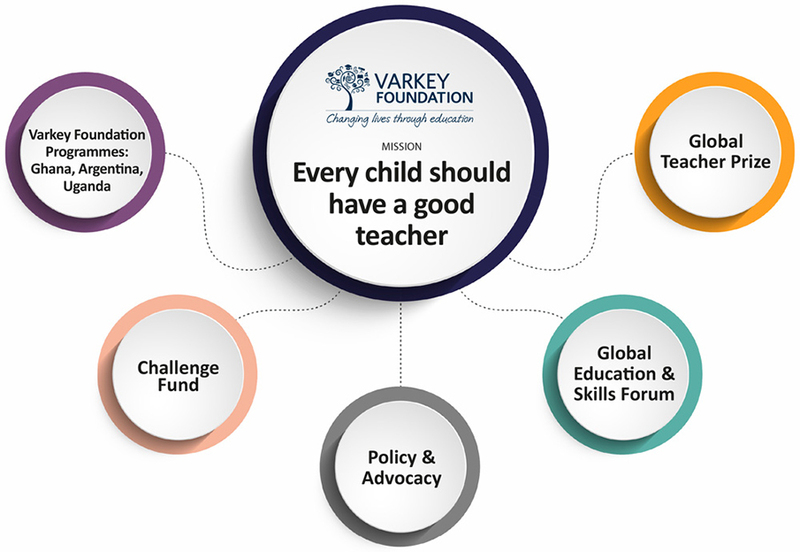 When education entrepreneur Mr Sunny Varkey created the Varkey Foundation, he entrusted us with a simple mission: to ensure that every child gets a good education, by having a good teacher. Today, the Varkey Foundation works across the world to make that vision a reality. Innovation: We promote innovation within and beyond our organisation to strengthen the hand of the teacher. We aim to push boundaries, and find new ways to solve new and existing problems. As a Foundation, we can be flexible and take greater risks; sometimes returns will be slow, or fail completely, but often they lead to our greatest success stories, such as The Global Teacher Prize. Evidence: We generate evidence about what works to improve educational outcomes. We place the teacher at the heart of this enquiry. We aim to learn from everything we do, and find new ways of generating evidence. Our evidence informs our policy perspective, as well as supporting decision-making on teaching practice, and adaptive programming. We are particularly curious about places where we work, and addressing areas where there is an evidence deficit. Influence: We build relationships, convene and mobilise networks to change the way people think about and support teachers. We make a case for system change to the elite influencers who hold the levers. We convene the education sector. We support and energise students, parents, the general public, and educators themselves to lobby for change and lead the change themselves. We are driven by evidence, innovation, and our values and moral imperative. Action: We work direct with beneficiaries because in itself this makes a difference to raising the status and capacity of teachers; we have a direct impact, we learn through doing; and deepen our understanding of the issues. We demonstrate proof of concept and establish ourselves as a serious and credible organisation. Steer and inform the global conversation on education: Every year, the Varkey Foundation invites leaders from the public, private and philanthropic sectors to our Global Education and Skills Forum in Dubai, UAE, to talk about how to deliver education, equity and employment for all. Train teachers and school leaders: Our programmes train teachers and school leaders in Argentina, Ghana and Uganda. As of the end of 2017, we have trained 46,000 teachers in over 3,000 schools and reached more than 1.6 million children. Research the biggest issues in education: The Varkey Foundation leads ground-breaking research into key issues, working alongside top academics and institutions. Today, our body of research covers over 40 countries, including Brazil, China, Egypt, India, Kenya, the US and the UK. Campaign for teachers: We campaign around the world to improve the status of teachers and the teaching profession. Every year, our US$ 1 million Global Teacher Prize celebrates the very best in teaching. Convene expert groups: We bring together representatives from government, business, education, academia, and the third sector to talk the issues that are shaping our world today – and how education can address global issues. Back innovation through grant-giving: We provide grants to innovative organisations which share our values. As of the end of 2017, The Varkey Foundation has backed eight projects in eight countries, training nearly 900 teachers and school and reaching over 10,000 pupils. We believe in the power of new ideas to shape the future of education.